I often argue that we need to preserve tax competition and tax havens in order to limit the greed of the political class. Without some sort of external constraint, they will over-tax and over-spend, creating the kind of downward economic spiral already happening in some European nations. Speaking of which, new evidence from Europe bolsters my case. Back in 2009, facing pressure from the big G-20 nations, all of the world’s major low-tax jurisdictions – even Switzerland – acquiesced to the notion that human rights laws protecting financial privacy no longer would apply to foreign investors. In other words, high-tax governments now have much greater ability to track – and tax – flight capital. So how have they responded since that time? 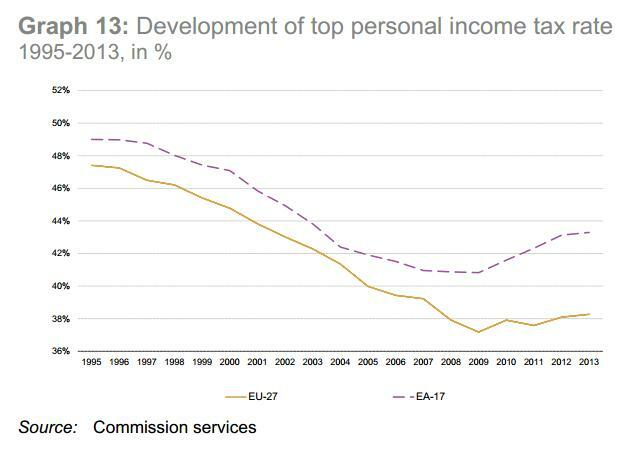 Well, look at this chart from the European Union’s new report on taxation trends. Tax rates have begun to increase, reversing a very positive trend (which began with the Reagan and Thatcher tax cuts, though this chart only shows data since 1995). We can’t say, of course, that the increase in tax rates since 2009 is because tax competition was eroded. Just like we can’t say the reduction of tax rates in the preceding years was because of tax competition. But we do know that simple economic theory tells us that monopolists are more likely to raise prices than firms in competitive markets. Likewise, governments are more likely to raise tax rates if they think taxpayers don’t have escape options. Well, those international bureaucrats (who, by the way, get tax-free salaries) are getting their wish. Tax rates are increasing. So the political class can breathe a sigh of relief. But what about the people of Europe? Well, economic growth is almost non-existent and unemployment is at record levels. Marie Antoinette eventually may have regretted her choice of words, but Europe’s current politicians are probably more clever and have contingency plans. When the you-know-what hits the fan and Europe descends into social disarray and economic chaos, ordinary people will be the ones at risk. Unfortunately, the United States is on the same path, as shown by these sobering charts from the Bank for International Settlements (and also as illustrated by these very funny Michael Ramirez and Bob Gorrell cartoons). For more information on the important liberalizing impact of tax competition, here’s the video I narrated for the Center for Freedom and Prosperity. But remember that restraining fiscal burdens is not the only reason to preserve tax competition and tax havens. There also are very important moral reasons to support low-tax jurisdictions. You’ll find only a pair of possible effects using these types of alternatives which offer a set give back for all that will put money into them. For you to trade responsibly, you have to have a game approach, adhere to a set price range, and also pass suggestions of this broker, not really how you think. Binary Options In The Money gives many choices for instance basic, feel and also 58 next dealing. and efforts in addition to funds usually are treasured. Europe is a disaster now… And tax rates are increasing… Cause and effect?